If you live in a small home then chances are, you have made several lifestyle changes to create a living space that works with your children. While small space living has its perks, it could also mean endless cleaning and developing a high tolerance for noise if you are sharing your home with children. Having a baby? As more baby stuff pile up, things are happening all at once so it’s understandable to feel a little overwhelmed at the number of baby items that you have to get to prepare your home for the baby. But pace yourself, your wallet will thank you for it. Don’t fill an already small space with more stuff. Instead, stick with the essentials to keep the nursery light and airy. This way, you are not forced to find storage solutions for bulky items that are too hard to contain. Buying more baby items could also mean having more objects to clean in the future. We’ve already outlined some of the most space-efficient baby essentials that every nursery needs, check out that list if you’d like to pare down your shopping list for baby must-haves. From bookshelves to tables, crib to dressers; invest in foldable, multipurpose pieces of furniture that grows with your children. This way, you will save more money on pricey pieces of furniture while also optimizing every square inch of space you have to spare. Multipurpose baby pieces, like a crib that transforms into a toddler bed or a dresser that pull double duty as a changing station, grows with your child. Since your kids won’t outgrow these pieces of furniture anytime soon, you will save more money on children’s furniture. On top of that, you’ll get to maximize the money you spent on these items because the kids will get plenty of use of them! Small space living is all about making the most out of what you have. Instead of making a cramped space look and feel even more cramped by acquiring more things, just make do of what you have. For example, you can use your baby’s old baby gym as a clothing rack for your growing child. If you have unused bins or old crates, these will come in handy when storing a variety of seasonal items. Just stow them under the bed or crib to maximize your floor space. You can use your existing console table as a makeshift bookcase or activity table for your kids, instead of buying a new bookcase. If closet space is problematic, consider using tension rods to double the hanging space instead of investing in a new closet system. Unfortunately, standard sized everything will be too bulky to fit small rooms so downsize if you must. We’re talking about using smaller sized appliances to make room for bigger, more important things in and around your home. For example, if you are buying a room fan, get the more compact version so the fan won’t take up much space. The same thing goes for kitchen appliances, bathroom appliances, and so on. Think small and compact. When your home has more room, the space won’t feel as cramped when you’re sharing it with two or more children! Living with two kids or more makes clutter build up so easily, you simply cannot afford to be sentimental! Go ahead and do a bi-yearly or even a once-a-month purge. Sort through the clutter. Use a keepsake box to store items that you’d like to keep – such as a couple of your children’s artwork – and then the rest, discard them. If your kids have outgrown some of their baby items, like car seats, crib, play mats, diaper bags, etc., loan them to a friend if you are thinking of having more kids in the future. But if you’re no longer planning to expand your family, donate these bulky baby items. If your children’s room is filled with toys that they no longer use, stow these in a bin and store the container under the bed. If these toys remain untouched for at least 6 months, donate them. Is your home filled with multiple items such as sippy cups, towels, slippers, etc.? The kids won’t maximize multiple items that have the same purposes. They don’t need a drawer full of feeding bowls or ten bibs! Avoid buying multiple items because 1) these only take room in the home and 2) these are a waste of money. Instead of buying the same thing repeatedly and wasting money, learn to reuse. Reusing children essentials is not only practical; it’s also eco-friendly! Large bins and hampers are a godsend when you are living with children. These multipurpose containers are not only compact; they make everyday cleaning and organizing so easy. From dirty clothes to soft toys, use bins and hampers to store large and small items. This way, the floor is free from clutter. Just stow a bin in every corner of a room, including the entryway, bedroom, bathroom, children’s room, even the living room. Even better, train your kids to clean after themselves so you don’t spend most of the day chasing after clutter. Be selective in terms of the size and number of toys that you allow your kids to have. If your kids have enough toys, do not buy anything new. And if you must buy, make sure the toys are small and easy to clean. Say no to huge teddy bears, fancy kids teepees, massive dollhouse, ball pits, or those cute monogrammed plush chairs. These are all nice to have but if you don’t have the room for these supersized toys, you might regret these purchases later. Also, kids tend to outgrow a lot of things too fast, including toys. In addition, large toys are so hard to clean compared to small toys, especially plush or soft toys. 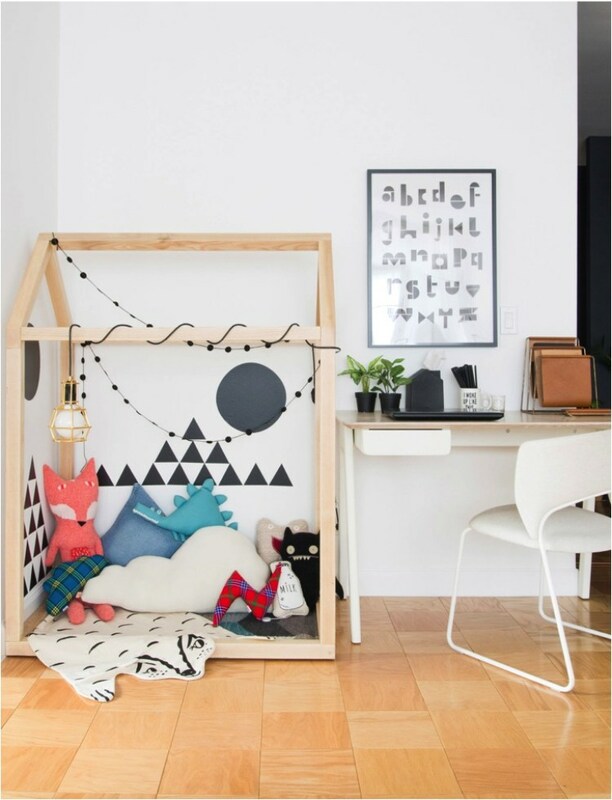 Sharing a small home with several kids has its challenges but with these tips, small space living is a breeze! Tune in for more home design tips and sign up for our free space optimized course here.